I was wandering around KirkM’s site at Just Thinkin’ and I found a new toy. It’s a yoke called Windows Live Writer. So I thought I’d give it a try. The main thing though is that I can create my musings on my Remington, without being connected to the Interweb. Now this doesn’t make any difference to me, but it will make a huge difference to the likes of our K8. It means she can write nice long posts, without having to run up huge phone bills. You write your post on your PC. You can play around with it until you are happy. Then you connect to the Interweb, press ‘Publish’ and up she goes. I don’t know if it will work. I know it connects to my site all right, but this is a first attempt at publishing anything. If all your PCs suddenly explode, then I’m sorry. 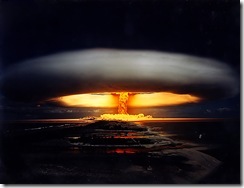 If half of Dublin vanishes under a mushroom cloud, when the server blows, then I’m sorry. If that happens, I’ll go back to WordPress. It looks ok from here, I haven’t heard any news about explosions, but then again being in the states, most people wouldn’t know what direction to look for it. I tend to just write my posts in open office or notepad because I have a habit of editing longer posts for at least a day before I publish. Maybe it’s the whole “windows” part of it I’m opposed to, I’m fighting vista on a daily basis as it is, but everything looks fine on this end. The only thing I would be concerned with is how clean the code is on the backend, as I’m married to a validation junkie. Is the cranky duffer in this cartoon you? If you can use your Remington to upload text, could I use my Dansette to upload music? I bought it on eBay a couple of years ago, and while excellent at giving an authentic feel to my vinyl 45s, it seems to have no USB port. I use it all the time. Great stuff. Can be a problem for people who don’t own their domain as you have to have somewhere to be able to upload the images when you upload the post. It’s a very clever yoke. Now, I must try my Simon and Garfunkel LPs and if that works I have some transparencies from a church slide show about missionaries in Africa that I could put on the web. With such technology, it should soon be possible to tune my wireless into the BBC Home Service. You! It was you that blew up my site today! Leave Kirk alone, he’s rebuilding my exhausted overstack trimidiformial. Geeky – Normally I agree about anything from Microsoft. This one seems to work though. Which is a first. As for validation – the only things that f*ck up my site are Google and a couple of plugins!! Diane – Yup. That’s me. I don’t speak Binary. Only Hexadecimal. Ian – I find there is nothing like a bit of bell-wire between the mains socket and the chassis. I get quite a buzz out of it. Sixty – Heh!! Blame Kirk. He started it!! Have used it about a year now. You will never use wordpress again. Code is poetry my arse. Noice!!! Will be giving her a lash to see what her craic is. By the way, in my usual inappropriate and ‘What’s THAT got to do with the price of eggs’ way, my incoming links on WordPress aren’t incoming! People who are linking to me must think me an awfully ignorant cow. What’s up with that, yo? Give Ron a clip round the ear for me, willya? I did not start it! Our mutual host is switching all their servers over to PHP 5 without prior notice to anyone and eliminating PHP 4 on said switched servers while they’re at it. Sixty was one of the first victims. I’m waiting for my take down since they haven’t gotten around to my server yet. On Windows Live writer. It’s very well behaved and works like a charm for WordPress (both types) blogger (with an FTP upload setup unless blogger now allows upload of images via API) and just about any other blogging platform out there that allows image uploads via API or FTP whether it’s hosted or your own. I’ve used it since day one. @Geeky Chick: The default output is straight html but you can easily change it over to xhtml via the options. SID – You use it to write poetry on your arse??? K8 – You should find it is a big help. As for the other; I haven’t a clue, and you know Ron is in Thailand or somewhere. Kirk M – You started it by suggesting Live Writer. Don’t go blaming your hoster. That’s an excuse and you know it. Anyway, if your hoster is playing silly buggers, it serves you right for getting cheap hosting. Is not cheap…just frugal. Sheeesh, it’s the one recommended by WordPress itself….Oh…guess that says it all huh? What a headline! Did I ever tell you how much I like coming here? What the heck is a “trimidiformial”? and why was I messing with it? Is it catching?